These red grapes grow in huge appetizing clusters at an Okanagan vineyard in BC. These grapevines are growing in the sun along Highway 3, also known as the Crowsnest Highway in the Similkameen River Valley; a popular area for wine production. 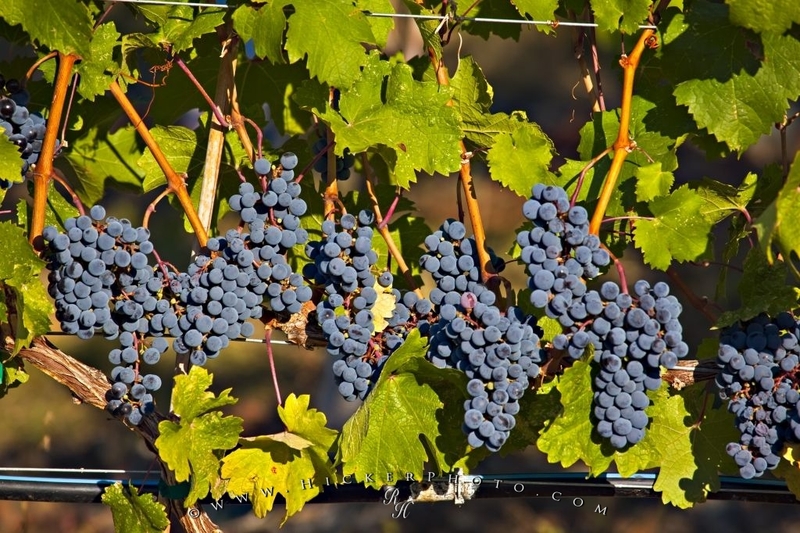 These red grape clusters are growing at an Okanagan vineyard along Highway 3, which is also known as Crowsnest Highway, in the Similkameen River Valley Region of British Columbia. This region is known for wine production and its reputation has grown steadily over the years and it is now one of the best places in British Columbia to get locally grown wines that are top quality. One of the best aspects to this wine producing region is the fact that although in the winter it can be colder than the rest of the Okanagan, in the summer the heat is trapped between the mountains and it stays hot long after the sun sets for the day. This makes for an ideal growing climate and it produces large and juicy bunches of grapes such as the ones seen here. Photo of red grape clusters growing on grapevines in the Similkameen River Valley, Okanagan, BC, Canada. Pictures from photo gallery "British Columbia Pictures"
This picture is part of the photo album "British Columbia Pictures" - there are more beautiful images waiting for you. ... wineries are now located in the Similkameen River Valley, with each one producing their own unique brand of wine from many different kinds of grapes. This area is both desert-like and composed of rich marshlands, so it has something to accommodate all growing needs. This area of wine production has been likened to regions found in Germany, France and Australia. This is partly due to the fact that wine makers have come from these countries to start their own wineries in the Similkameen River Valley, and they have brought some of the flavour of home with them. Clusters of grapes growing on grapevines at a vineyard along Highway 3 (Crowsnest Highway) in the Similkameen River Valley, Okanagan, British Columbia, Canada. I photographed this photo with the digital SLR camera model Canon EOS 5D Mark II, aperture of f/8.0, exposure time of 1/320 sec. on ISO 100, as always I used a original Canon Lens, the focus lenght for this picture was 400mm.